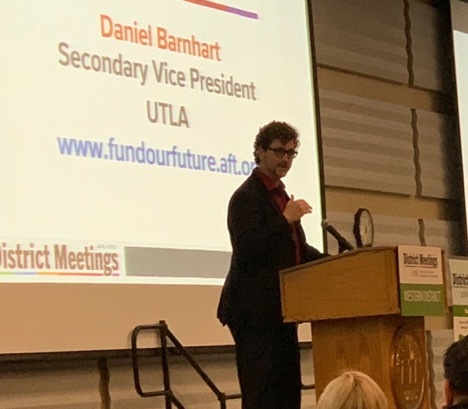 Sacramento_ CFI members recently participated in the California Labor Federation’s 2019 Joint Legislative Conference, a gathering in which unions and activists from all over the state join efforts to lobby for bills in favor of labor and to share ideas for future projects. Silvia San Martin and Jackie Ruiz from Region 4 and Tyler Nguyen and Janet Hudec from Region 3 attended the Building the Future conference held March 31through April 3 in Sacramento on behalf of our local. The conference emphasized the importance for all union members to get involved in the democratic process. Locals must have active Legislative and Political Action Committees to work on elections, educate members on the issues, and lobby for our interests. We see how unions can be weakened and how a single action of Congress or state legislature can eliminate advances. AB 1677 Call Centers, sponsored by Assembly member Shirley Weber. This bill would prioritize state grants and subsidies to corporations that retain call center jobs in California. AB 1677 would require that employers seeking to relocate call center jobs to another country give the Labor Commissioner 120 days’ notice; would prohibit employers appearing on the Commissioner’s compiled list of call center job exporters from receiving any state grants, guaranteed loans, or tax benefits for five years. AB 1677 is instrumental in our fight against Video Remote Interpreting (VRI). This bill will incentivize VRI call centers to stay in the state of California, hire Californians, and contribute to California’s economic growth. With a heathier economy, state funded budgets (like the Interpreter fund) have the opportunity to increase. AB 1066 Unemployment Insurance: Extended Duration Benefits, sponsored by Assembly member Lorena Gonzalez. This bill would provide unemployment benefits for workers during a strike. Ineligibility for unemployment benefits during a labor dispute creates an incentive for an employer to delay and be unreasonable during negotiations. Employers can try to exacerbate the financial hardship on workers as a strategy to secure a more favorable outcome during labor negotiations. This type of hardship should not exist for workers who are merely exercising their rights. Allowing workers to be eligible for unemployment insurance, after a period of two weeks, would create a more level bargaining field between employers and employees. AB 5 Defend Dynamex and Rebuild the Middle Class, a joint effort by labor unions joint sponsored by Assembly member Lorena Gonzalez. On April 30, 2018, the California Supreme Court issued a unanimous ruling in Dynamex Operations West v. Superior Courtthat made it harder for companies to misclassify workers as independent contractors. AB 5 will codify this decision and clarify where it applies. It will also exempt from the decision specified professionals where such protection is not warranted. The bill will clarify what employment relationships are not covered by the decision, providing certainty to industries that are unsure of the case’s implications. Currently, CFI Local 39000 is working on creating several future bills that will benefit our profession. More information will be provided in the near future. Stay tuned! We are only strong when we join forces, stand together, and fight together. In August of this year, in line with Recommendation 74 of the Language Access Plan, the Judicial Council formed the Interpreter Act Working Group; it was composed of court CEO’s, Judicial Council administrators and staff from the Court Interpreter Program, as well as both independent and union member employee interpreters. The Working Group was charged with reviewing and offering perspective on the present state of the Trial Court Interpreter Employment and Labor Relations Act, now incorporated into the California Government Code under Title 8, Chapter 7.5, Sections 71800 – 71829. The specific focus in the process was the four Region bargaining structure, the 100- & 45-Day Rule, and the Cross-assignment system. The Working Group’s co-chairs, Judge Austin, formerly the chair of the Court Interpreter Advisory Group, and Kim Turner, Mendocino Superior Court CEO, explained that these specific topics had come to be on the group’s agenda because of commentary and inquiries from “shareholders” to language access in the courts. 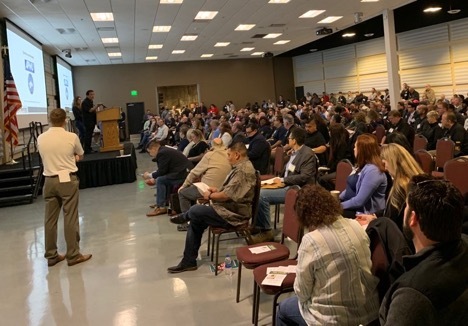 AFL-CIO held its 2019 Western District Conference on March 26thand 27th at the NetZero Electrical Institute in the City of Commerce. Dozens of delegates from Alaska, California, Hawaii, Idaho, Montana, Oregon, Utah, Washington and Wyoming were in attendance. The purpose of this conference was to bring together unions in an effort to collectively revise and assess the current state of the labor movement in those states. Unit member, Pedro Ramirez-Navas attended the conference as a representative of CFI. The opening plenary presented a great opportunity to meet other delegates and to hear reports about some of the most important struggles for workers rights taking place right now. The dreadful feeling of despair and hopelessness that dominates our current political environment quickly disappeared and gave way to an atmosphere of hope and confidence after the first dynamic presentation. The American Postal Workers Union delegates reported on the recent efforts by the Federal government to privatize the postal service. These efforts include the creation of a White House Task Force that generates false financial information. In its findings, this task force has issued a report that is attempting to create an image of a budget and management crisis in the postal service in order eliminate collective bargaining, reduce wages, raise rates and outsource the services of the USPS. Of course none of this will happen without a fight. Our sisters and brothers will most definitely need our support. Stay tuned for updates regarding this important battle. The conference also held several workshops and CFI participated in two of them. The first workshop was titled Power to Win-Worksite Organizing Programs that Deliver. This discussion group addressed essential techniques utilized to organize our colleagues at the worksite. The second workshop was titled Membership Has Its Benefits: Maximizing the Union’s Value for Members. This group provided useful information for services that our members might find important, such as assistance to purchase a new home, a new vehicle, debt consolidation and even financial assistance for college education. All these services are available to our members through the Union Plusprogram. If you would like to find out more information, please contact your shop steward. The conference was an impressive achievement, from lodging to meals, to transportation, to electronic updates and timely sessions. It was a testament to the capacity of the organizers and it gave delegates confidence that there is light at the end of the tunnel. The current political climate is against working people, our quality of life continues to decline rapidly and for some it might seem as if all is already lost. However, there is hope and it is within each and every one of us. When working people come together we can make history and change the world. We now know that we can fight, but we must move forward. Recent developments have shown us that not only we can resist, but we can also win!